The Kabbalists teach that God exists in the relation between two humans. If this is so, and God is made of holy fire, then it is in the relation between humans that human souls turn from divine sparks into brilliantly shining flames. As David Patterson says in his work, Overcoming Alienation: A Kabbalistic Reflection on the Five Levels of the Soul, “[t]he soul transforms darkness into light by transforming isolation into relation,” (Patterson, 32). One also engages in a relation through writing or telling stories and reading or hearing stories. Thus, the relation within stories also ignites a fire. This is why storytelling is viewed as so sacred within Judaism. are made of fire. According to the legend, the text is made of black fire and the scroll is made of white fire. Rabbi Lakish said that, “The scroll was itself fire... hewn from fire, completely formed of fire, and given in fire,” (Patterson 135). It is suggested that this teaching is drawn from Rabbi Chanina ben Teradyon, a holy man who performed the act of Kiddush Hashem, to die with the name of God on his lips rather than to defy the divine mitzvot, or commandment. Rabbi Chanina lived in the time where Roman authorities prohibited Jewish practice. Rabbi Chanina feared the wrath of heaven more so than that of the Romans, so he kept his Jewish commandments and continued to study Torah. One day he was caught in public with a Torah scroll spreading the teachings of Moses, and the Romans decided that they would make their intentions clear by burning him alive. They bound him in the scroll he had and piled kindle around him. The Romans then wrapped him in wet wool to intensify the torture that he would endure. Rabbi Chanina’s daughter, who was with him during this experience, weeped for her father and for the Torah that were burning. Her father then said to her, “You needn’t shed tears for the Torah, little one... For the Torah is fire. And fire cannot burn fire,” (Patterson 136). So it is taught that the Torah itself is made of divine fire. And called it the soul. This implication that the soul and the body are fueled by holy fire “can be seen in every electrical impulse that charges every nerve and that underlies every movement, from the beating of the heart to the raising of the hand,” (Patterson 30). Patterson goes on to say that, “when the soul burns with the light of Torah, the Light of God that is called Torah emanates into the world through that soul. For only the soul, in its manifestation as a body, can perform the mitzvot through which the divine light shines,” (Patterson 30). References to fire and light are plethoric throughout the Bible. As it says in Genesis, “God said, “Let there be light!” and there was light. God saw how good the light was and God separated the light from darkness.” This light is the light that is emanated from the fire that is God. As the sun sustains all life on the planet with the light that is emanated, God sustains all life in the same manner. hermeneutics of the role of fire in the Torah, one begins to see that fire is typically associated with God, angelic forms, and the higher, heavenly realms of existence. before, is repeatedly associated with fire. In the book of Kings, Elijah’s departure is unique as well as uncanny. As Elijah and Elisha are approaching the Jordan River, accompanied by fifty men from the brotherhood of prophets, Elijah took his mantle and penetrated the waters of the Jordan River. The waters then parted, and Elijah and Elisha walked through the river on dry land. Elijah then informed Elisha that he may be taken away if God wills it so. Elisha then asks if he can integrate Elijah’s soul into his. Elijah then tells Elisha that if he is taken away, then he will get his wish. Suddenly, a chariot made of brilliant flames and driven by fiery horses descended from the heavens and swooped Elijah up. That is the story of the departure of Elijah from this physical realm via the Merkava, or chariot. Once again, we see that fire is associated with the heavenly realms. attempting these advanced meditations unless the individual has read and reviewed the Torah, Prophets and Writings (that is, the entire Bible), and have mastered the Mishnah, the Law, the Agadah, as well as the deeper meaning of Law regarding what is permitted and what is forbidden. Secondly, he must be an individual who keeps the entire Torah, and heeds all of its prohibitions, decrees, judgments and laws, taught to Moses on Sinai (Kaplan, 49). So, according to Jewish mystical lore, it is said that only devout Jews who keep all 613 commandments should use the advanced meditation techniques. Those who make the attempt but are not yet ready may be ruined psychologically or possibly even die. on one’s capability to enter. “If he is worthy, it becomes the mirror through which he perceives, while if he is not worthy, he is burned out and ‘cut off’ by the fire of the sword. The one who oversees the sword, preventing the unworthy from entering is the angel Metatron. The turning sword itself is the cycle of the intellect,” (Kaplan 80). of God. The letter permutation methods are insinuated in the Sefer Yetzirah. According to Kaplan, “[t]here is a special technique known as cycling through which one permutes the letters of a word in a prescribed manner. Writing in this manner is a type of meditation,” (Kaplan 83). Other aspects of Abulafia’s meditation processes involve moving one’s head in specific motions that represent drawing of specific letters from the Hebrew alphabet that correspond to the names of God one is chanting. In Daniel Matt’s book, Essential Kabballah, he says that, “those who practice aloneness and unify the divine name kindle the fire on the altar of their hearts. By their pure thought, all the sefirot are unified and linked to one another until they are drawn to the source of the infinitely sublime flame,” (Matt 119). These sefirot that are mentioned here are alluded to in the Torah and elaborated on in many Jewish mystical works. 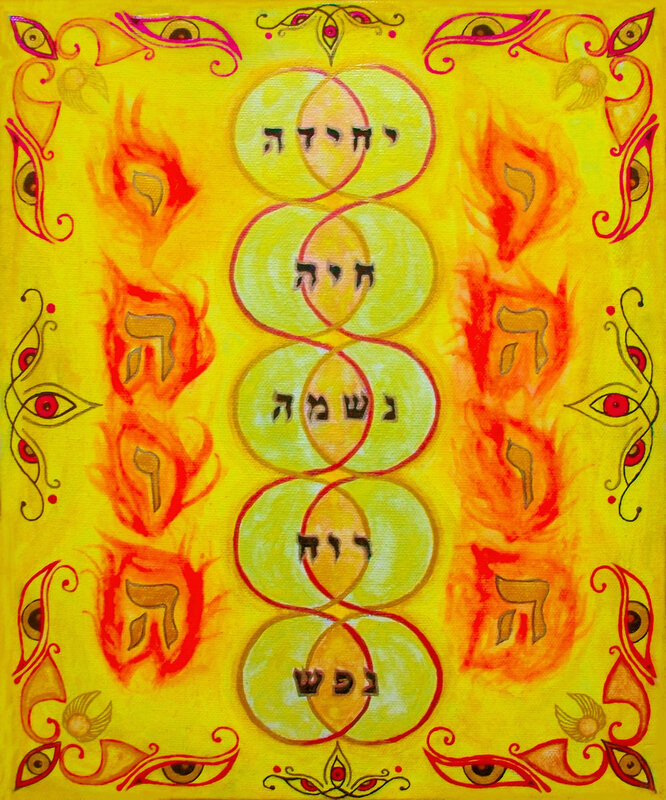 The ten sefirot, portrayed as vessels of light on the Kabbalistic Tree of Life, are connected, yet separate. Each sefirah has different characteristics, and all are perceived to be aspects of God’s character. They are also viewed as maps of creation as well as maps of the human soul. macrocosm exists within the microcosm, then every thought and every word has an impact on all of existence, so it is essential that we humans choose to fill ourselves with love as the Great Spiritual Matrix does. It is only in a loving relation with God, the world, and humanity that we can facilitate the elevation of all souls. In the act of embodying love and relating to others with love, we assist in transforming all human souls from sparks into loving and enlightening flames. revival of Jewish mysticism in Eastern Europe was started by the great Baal Shem Tov. “Raising the sparks” is a popular phrase used and enacted by Hasidic Jews. It is also said that one of the reasons why they sway back and forth as they are praying is to embody the flickering flame. manipulation of fire. There are certain rules on the Sabbath that Jews must abide by, and many of these involve fire. According to Jewish law, Jews are not permitted to start fires on the Sabbath. This is to show respect to God by not manipulating aspects of his creation. Turning on and off electrical appliances also applies to this rule because an electrical current is considered to be a fire. The Jewish teaching says that the Sabbath creates a dwelling place for the Divine Creator here in this physical realm. Out of respect for The Holy One, the Jews do not start fires or do anything creative on the Sabbath. However, Jews do ritualistically light candles at certain times on this sacred day. The only light that is to be ignited on the Sabbath are special candles that are lit eighteen minutes before sunset. Traditionally, Jewish women light these candles as a symbol of the Shekhinah, which is the emanation of God in this physical realm. The Shekhinah is taught by the Jewish mystics to be a feminine emanation of God’s presence. And from discussing the finale of the Sabbath, we come to the conclusion of this post. From Biblical tales to Midrashic tales, and from commentaries on mystical practices to rules of the Sabbath, Judaism is immersed in heavenly flames. Sometimes these flames light the way to achieve enlightenment; sometimes they represent God in divine glory. It is important to continue the examination of the esoteric interpretations of fire in sacred texts and teachings. It is through this search for meaning that we uncover knowledge and wisdom of spiritual matters, in turn gaining a deeper understanding of the divinity of God, the world, and our very own souls. Patterson, David. Greatest Jewish Stories. Middle Village, NY. Jonothan David Publishers, 1997. Patterson, David. Overcoming Alienation. Baltimore, MD. Publish America, 2008. Kaplan, Aryeh. Meditation and Kabballah. San Fransisco, CA. Weiser, 1982. Matt, Daniel. Essential Kabballah: The Heart of Jewish Mysticism. New York, NY. Harper Collins, 1996.